The particle system is intended to visualize phenomena which are caused by the movement of numerous small objects such as smoke, fire, water splashes and other. A particle system requires an emitter - an object which defines the location and the direction of the outgoing particles flow. Add a mesh emitter to the scene. Create a material for particles on the emitter, for example of the Halo type. The Surface material type with a mandatory diffuse texture is also supported. Add a particle system on the emitter. “cyclic emission” - enable the Emission > Cyclic emission option for the particle system and the Animation > Apply Default Animation for the emitter. “non-cyclic animation” - enable the Animation > Apply Default Animation option for the emitter. Set the Add transparency type for the particles’ material. Disable emitter rendering if needed using the Particles > Render > Emitter checkbox. If an emitter is required on a scene use additional materials for it. 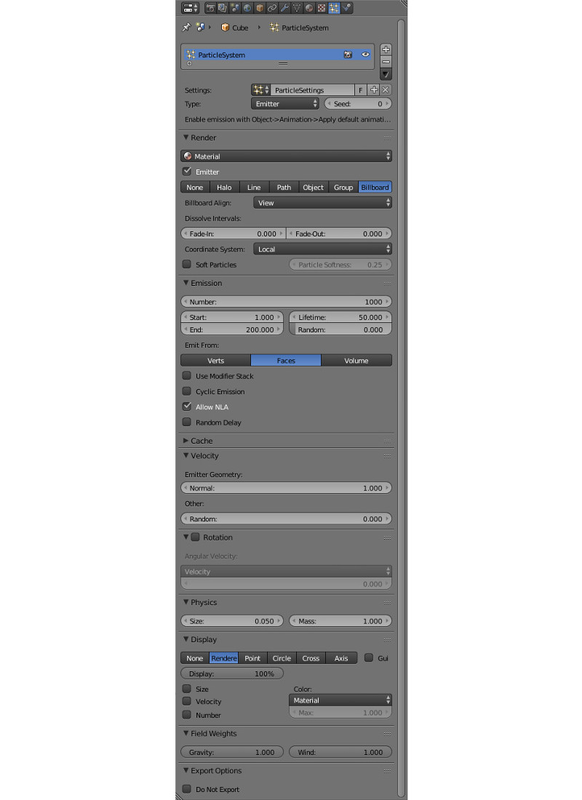 In this case select the particles’ material in the Particles > Render > Material menu on the particles settings panel. If the Surface material type is used it is required to add a diffuse texture (normally with the alpha channel) to this material. Select UV in the Mapping > Coordinates menu. Make sure that the emitter’s mesh has a UV layer. 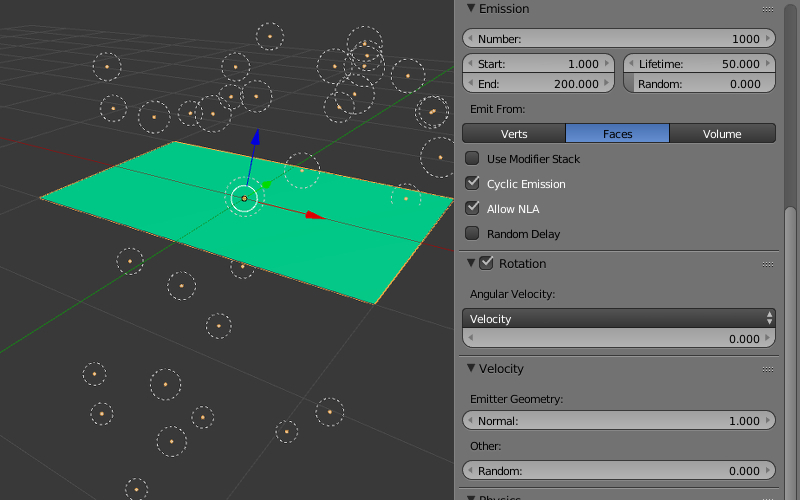 The particle system parameters can be set up under the Particles tab. 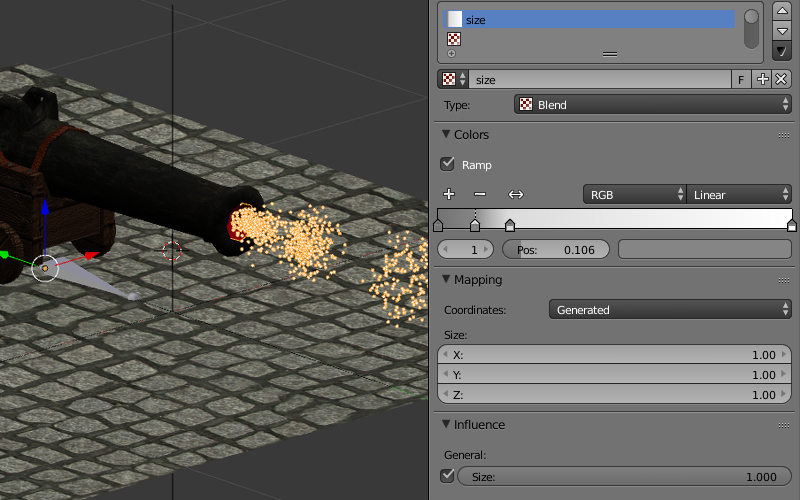 Multiple particle systems per emitter are supported. Particle system name. The default name is “ParticleSystem”. Reference to the settings datablock of the particle system. The datablock settings can be shared between different particle systems. Particle system type: Emitter or Hair. Hair particle systems can be used to create numerous copies of an object (so called instancing). The default is Emitter. Index in the table of random numbers which are used for particle system generation. The default value is 0. Number of particles. The default value is 1000. The first frame after which the emission of particles starts. The default value is 1.0. The last frame after which the emission of particles ends. The default value is 200.0. The lifetime of particles measured in frames. The default value is 50.0. The random factor for the lifetime. The default value is 0.0. Emission source type. The following types are supported: Verts (emit from vertices), Faces (emit from polygons). The default is Faces. The option enables the cyclic emission mode. It can be used for permanent effects (such as smoke, burning, water splashes). It is recommended to set the Emission > Start value to zero. Disabled by default. Activating this option allows particle emission to be controlled by NLA. Enabled by default. The option enables a random emission time for particles. Disabled by default. Factor influencing the emission along the emitter’s mesh normals. The default value is 1.0. Factor of randomization for emission direction. The default value is 0.0. Mode for particle billboards self-rotating. Hair particle system supports all the types of rotation and Emitter supports only Velocity. Factor of rotation velocity for particle billboards. The default value is 0.0. Physics calculation type: No, Newtonian, Keyed, Boids, Fluid. Ignored by the engine. Newtonian physics is always used. The default is Newtonian. Particle size. The default value is 0.05. Particle mass. Affects interaction with force fields (such as wind). The default value is 1.0. Exported but not used by the engine. 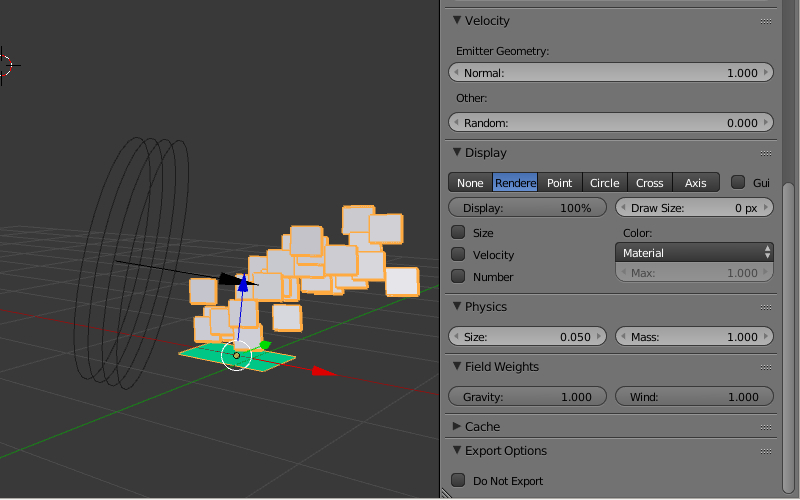 Menu for selecting the particle’s material. Used for referencing to the particle’ material in case multiple materials are used by the emitter. The default value is Default Material. Enables emitter rendering on the scene. Enabled by default. Particle rendering mode: None, Halo, Line, Path, Object, Group, Billboard. 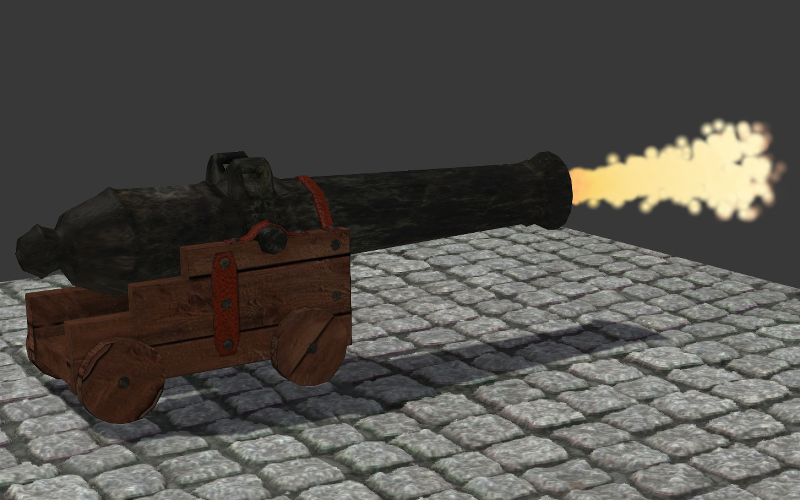 The engine supports the Object and the Group modes which are used for objects and groups instancing respectively. Other modes are ignored. It is recommended to use the Billboard mode for convenient display of billboards. The default is Halo. The way billboards are oriented: View - follow the camera, XY plane, YZ plane, ZX plane - align to the corresponding plane (in the world coordinate system of Blender). The default is View. Rotation angle of the billboard planes. Its value can vary from -1 to 1. The value of 1 rotates by 180 degrees (i.e. turns the billboard upside down). Set to zero by default. Random variation of tilt. Its value can change from zero to 1 and is set to zero by default. Starting and ending intervals (measured in frames) for gradually increasing and decreasing the particles’ transparency. Coordinate system of emitting particles: Local - use local coordinate system of the emitter object, World - use world coordinate system. Support for soft particles, billboards of which smoothly dissolve when contacting with surfaces. Use the Particle Softness slider to tweak this effect. Gravity influence factor (Earth’s attraction). The default value is 1.0. Wind influence factor. A Wind force field source should be present (can be added using Add > Force Field). A particle system is also influenced by the wind direction and strength. The default value is 1.0. 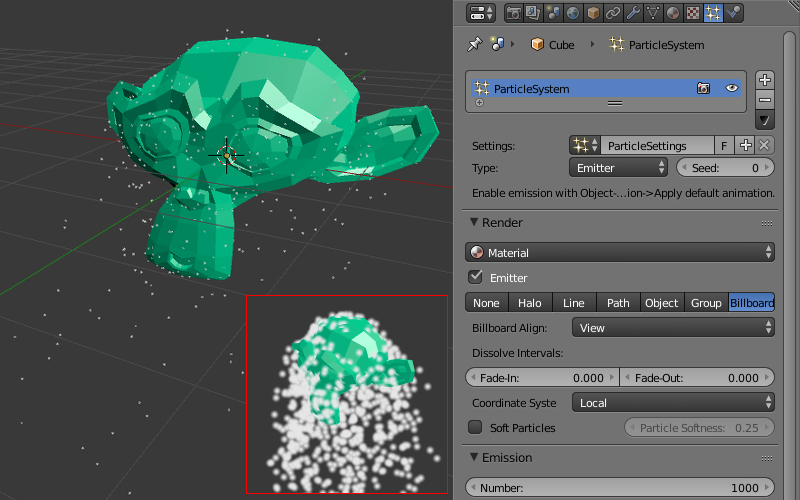 Particle systems support both standard and node materials. Supported material types are Surface and Halo. All additional settings of the Halo type materials, such as Rings, Lines and Star Tips, are also supported. For the Surface particle’s materials it is required to have a diffuse texture (normally with an alpha-channel). In the Mapping > Coordinates menu choose the UV option. Make sure that the emitter’s mesh has a UV layer. 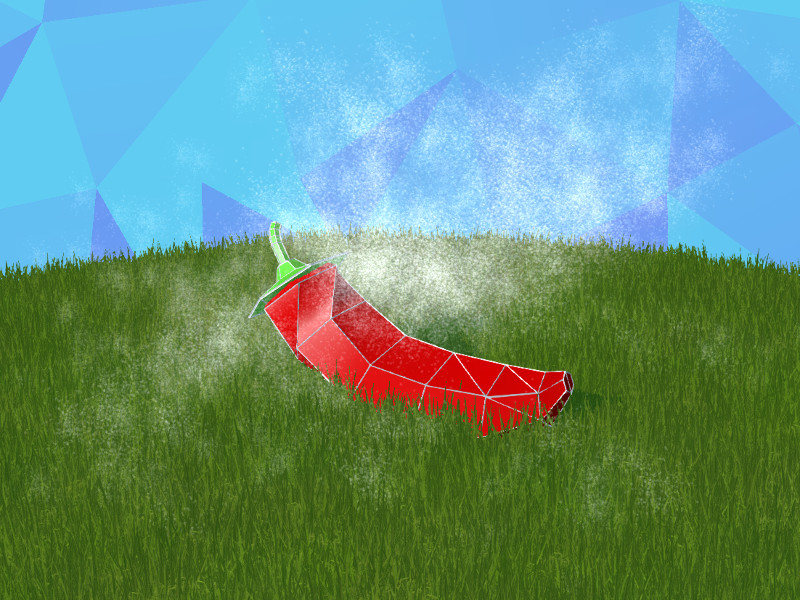 For the Halo particle’s materials it is possible to use a Blend texture with a Linear gradient. In the Mapping > Coordinates menu choose the Strand / Particle option. It is required to enable Ramp on a texture. 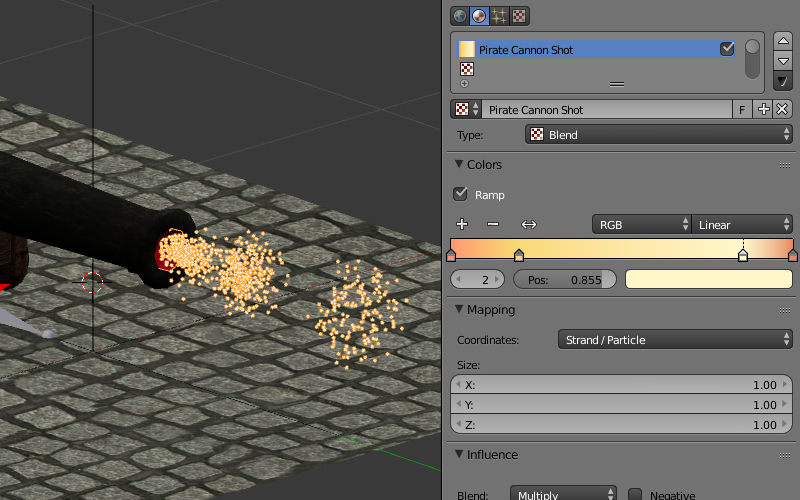 Textures can also be used for setting up the behavior of particle systems. Unlike textures for particle materials such textures belong to the particle system datablock, not to the material datablock. To create a texture for the particle system it is required to go from the Particles tab to the Textures tab and then to click the New button. The only supported type of textures is Blend with a Linear gradient. Ramp should be enabled on the texture. Up to 4 gradient control points are supported. On the Influence panel choose the parameter which is influenced by the texture. At the moment the only supported parameter is Size.